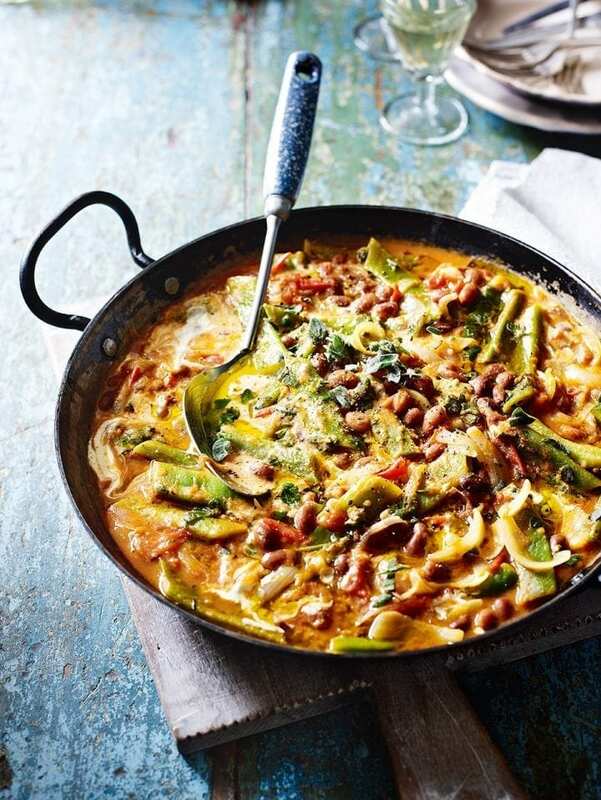 Completely vegetarian, completely gluten free, completely scrumptious – a great summery stew that you can make-ahead. Put the shelled borlotti beans in a large pan of water. Bring to the boil, then turn down the heat and simmer for 25-40 minutes until tender. Drain and set aside. Heat the oil in a large sauté pan, then fry the onions gently for 10 minutes or until soft but not coloured. Add the garlic, chilli flakes (if using) and whole sage leaves, then cook for a few minutes more. Add the tomatoes, taste, then add the sugar if needed. Bring to a simmer, then cook for 5-10 minutes, stirring, until reduced. Add the borlotti and runner beans with 200ml stock and bring to a gentle simmer, then cook for another 8-10 minutes until the borlottis are just beginning to fall apart and the runner beans are tender. You may need to add a little more stock – the stew should be saucy but not soupy. Stir through most of the chopped sage and oregano, then stir in the mascarpone. To serve, drizzle with oil, scatter over the remaining herbs, then spoon into bowls. If you’re not on a gluten-free diet, a hunk of crusty bread on the side goes well. Find fresh borlotti beans in greengrocers or specialist shops. Or use 2 x 400g tins borlotti beans, drained, and skip step 1. Make this 2 days in advance (don’t add the mascarpone) and chill in an airtight container. To reheat, bring to a simmer, then stir in the mascarpone. Serve as in step 3.